How Much Would Amazon HQ2 Drive Up Rents? Prime Markup: How Much Would Amazon HQ2 Drive Up Rents? Amazon’s HQ2 decision, as we first analyzed last year, had the potential to bring a massive disruption to the contest winner’s housing market. In the end, however, this concern was much ado about nothing. 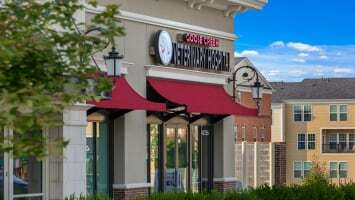 Several outlets have now reported that the new headquarters will be split between the Crystal City neighborhood in Arlington, VA and the Long Island City neighborhood in New York City. Apartment List research initially predicted that HQ2 landing in either the DC or NYC metro would have relatively small housing market impacts. When ranking the HQ2 finalists by expected rent growth, New York City came in last and the DC metro was fourth from the bottom. These are large, well-connected metros that can absorb these new jobs more easily than other locations being considered. Moreover, these locations have ample high-skilled technical talent, so Amazon is more likely to hire within market, rather than recruiting employees into the metro, increasing the total number of bodies that need to be housed. With HQ2 becoming HQ2a and HQ2b, the already small rent effects get diluted further. Half the initial influx of jobs will likely lead to a more than two-fold reduction in expected rent growth. With fewer jobs to fill, Amazon is even more likely to hire employees already in the market, and the agglomeration effects that create additional jobs outside of Amazon are likely to be smaller. All told, we anticipate that the HQ2 decision will lead to 0.1-0.2% in additional annual rent growth in the D.C. metro and less than a 0.1% increase in rent growth in New York City. With that said, the exact neighborhoods where the HQ2s land will certainly change. Rents in close proximity to the new jobs will rise, and select blocks near convenient public transportation stops will see some appreciation. Moreover, even an additional fifth of a percent may cut even more into working families paychecks. In New York City, 52% of renters are cost burdened, and 48% of D.C. metro renters can’t afford their current rent. Though not a market disruption by any means, this small increase may still be felt in a big way by families in neighborhoods near the new Amazon hubs. On January 18, 2018, Amazon released its list of the 20 finalists for its new HQ2. Over 238 cities from across the United States, Mexico and Canada submitted proposals, hoping that an increase in jobs and investment could bring widespread and lasting economic growth to their regions. No matter which city is chosen, the influx of 50,000 high-paid Amazon workers and 66,250 supplementary workers over a ten-year period will put pressure on local housing markets, driving up rent and home prices. 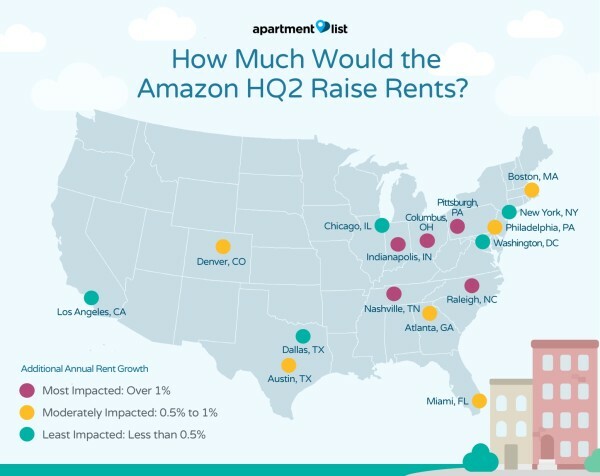 In October 2017, Apartment List released an analysis of the impact of the Amazon HQ2 on rent prices in some of the cities bidding to host Amazon’s new headquarters. Apartment List has updated our analysis to include the metros on Amazon’s list of finalists that we did not analyze in our original report. Our analysis leverages data from the U.S. Census and Bureau of Labor Statistics to determine how much new housing a metro can build, the amount of slack in the housing market and the impact of an influx of high-wage workers. 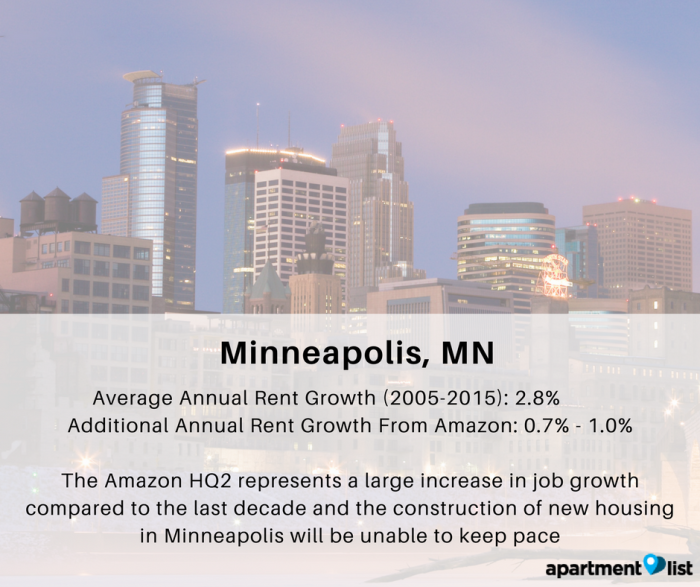 All metros studied will experience additional rent growth from the Amazon HQ2, but to differing extents, with smaller metros generally experiencing greater rent growth. We project that Raleigh, N.C., Columbus, Ohio, Indianapolis, Pittsburgh and Nashville, Tenn., will feel the rent increase the most, with additional annual rent growth between 1.2 percent and 2.0 percent. The impact will be smaller in metros with large housing stocks such as Washington, D.C., Los Angeles, Dallas and New York, with additional annual rent growth project at or below 0.5 percent a year. Full data for 16 of the contending metros can be accessed below, in addition to our original analysis of the factors that explain why rent growth is steeper in some metros than others. 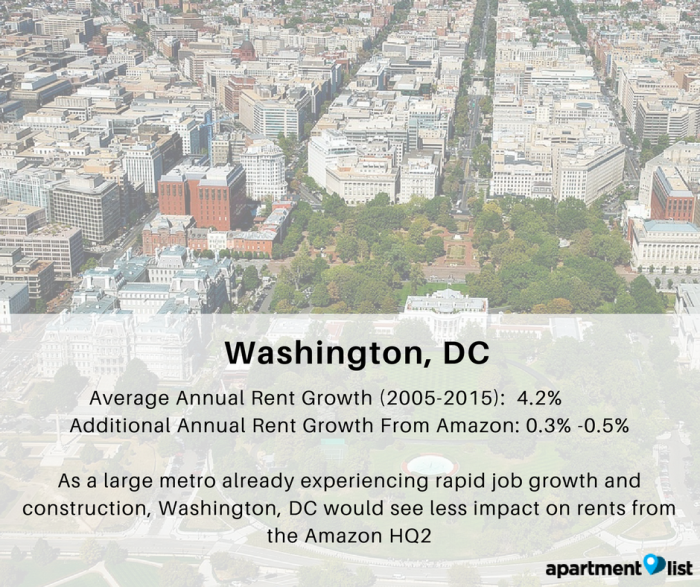 For press requests about the impact of Amazon HQ2 in your metro, please contact rentonomics@apartmentlist.com. How will the new Amazon headquarters impact the housing market in the metro it moves to? In Seattle, home of the company’s current headquarters, the influx of high-paid Amazon employees has coincided with rent increases that outpace almost all other U.S. cities and the fastest growth rate in home prices nationwide. Apartment List studied the impact on rents in 15 metros contending for HQ2, and predicts an additional annual rent increase of up to 2 percent per year on top of the rent growth those metros would experience without the Amazon HQ2. Although a one or two percent rent increase per year may not sound like a lot, the additional rent growth comes at a time when rents are already rising rapidly nationwide and half of renters are cost-burdened, spending 30 percent or more of their income on rent. Additionally, the fact that one company can have such noticeable impacts on the rental market, especially in metros with a constrained housing supply, is astounding. Since Amazon executives announced early last month that it plans to select a U.S. city for a second corporate headquarters, or “HQ2,” speculation has been swirling about which city the retail giant will crown. Proposals are due October 19, with many cities expected to offer Amazon tax breaks and other incentives to win the new headquarters. Amazon executives say they are looking for a large metropolitan area with strong job growth, an educated labor pool, proximity to universities, relatively affordable housing and a strong transportation system. Many cities have been proposed as possibilities, including Denver, D.C., Chicago and Atlanta, and many cities in between. Even smaller cities, including Danbury, Conn. and Frisco, Texas have submitted longshot proposals for the HQ2. Although it’s clear the Amazon HQ2 will create a significant number of jobs, residents in these metros are still concerned and curious about the impact of a new headquarters on rents. With rents already on the rise in most cities nationwide, Apartment List studied the top Amazon HQ2 contenders to project the impact that the new headquarters would have on local rents. We analyzed data from the U.S. Census and Bureau of Labor Statistics to determine how much new housing a metro can build, the amount of slack in the housing market and the impact of an influx of high-wage workers. All metros will experience additional rent growth from the Amazon HQ2, but to different extents. We project that Raleigh, N.C., Pittsburgh and San Jose will feel the rent increase the most, while the impact will be smaller in Washington, D.C., Los Angeles, and Dallas. To determine the amount of housing a metro can build to house Amazon workers, we combined historical building rates with an ease of building factor. Based on current job growth rates plus the additional 50,000 Amazon workers and 66,250 supplementary workers to be added over the next ten years, we project that many metros will add more jobs than new housing. 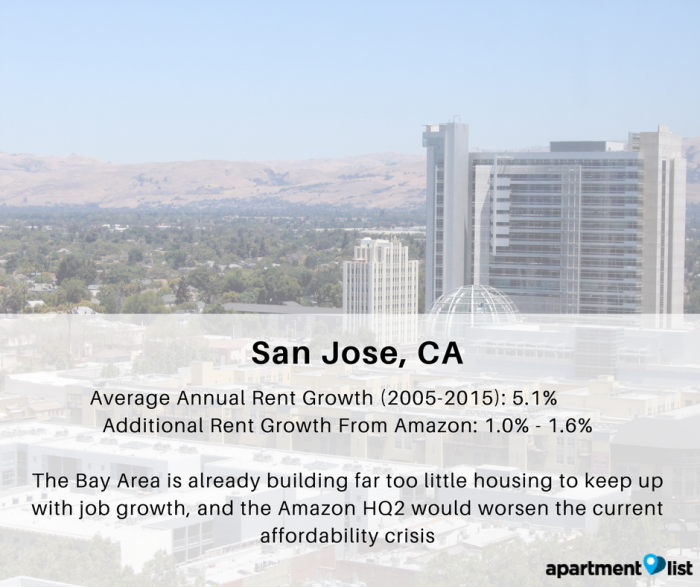 Metros, such as San Jose, where it’s difficult to build, will see rents skyrocket with the new housing demand from an Amazon headquarters. Metros, such as Dallas, that have kept up with existing housing demand and have laxer building regulations, will see lower rent increases. Large markets, such as Detroit and Atlanta, with high vacancy rates, have the most slack and, thus, need less new construction to house new Amazon employees. As seen in Seattle, an influx of workers with wages higher than the area median can raise rents, especially when there is a shortage of available housing. To capture this effect, we factored current wages with the additional income from Amazon to determine the impact on the rental market. Amazon has the biggest impact on wages in smaller metros and metros with lower median wages, such as Raleigh and Pittsburgh. According to Apartment List analysis, rents in Raleigh, San Jose, Baltimore and Pittsburgh will be the most impacted by Amazon choosing to build its HQ2 in their metros, with rents expected to increase by an additional 1 percent or more per year over the next ten years. Locations with the largest rent increases are smaller metros, with populations between 1.3 million people and 2.8 million people. San Jose is already building at too slow a rate to keep up with job growth, so the addition of 116,250 Amazon HQ2 jobs over ten years would send rents through the roof. Raleigh, Baltimore and Pittsburgh are better equipped to build more housing, but will still feel the impact of 50,000 new high-paid workers entering the housing market. As a smaller metro, Raleigh would experience the largest increase in rents from Amazon HQ2, because it will be unable to build enough housing to sustain such a large increase in workers. The Raleigh-Durham metro has been touted as a potential Amazon HQ2 location because it is part of what is known as North Carolina’s “Research Triangle,” home to multiple top universities to recruit employees from. However, with its relatively small workforce, the metro would still have to attract many workers from other parts of the country as well. 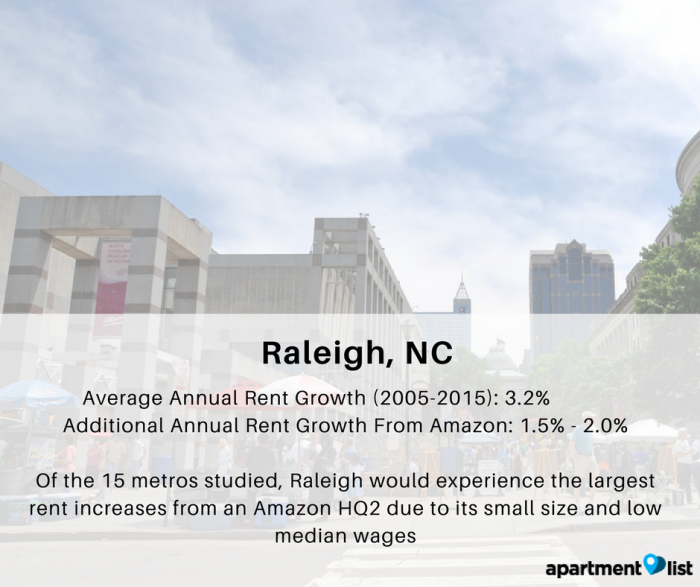 With more competition for existing housing and an influx of workers with higher wages, we expect rents to increase significantly in Raleigh as a result of Amazon HQ2. Rents are already skyrocketing in the Bay Area, increasing 57 percent in the San Jose metro from 2005 to 2015. The addition of Amazon HQ2 would make matters worse. With an onerous permitting process, San Jose added 3.2 jobs for each new building permit from 2005 to 2015, a figure that is predicted to grow to 4.7 jobs for each new building permit if a new Amazon headquarters comes to the city. With the lowest vacancy rate of the 15 metros studied, the San Jose metro has very little slack to incorporate the additional workers. 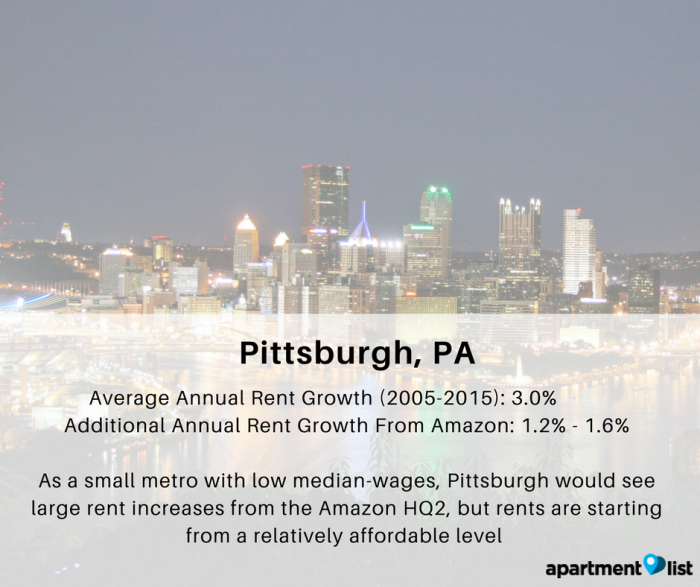 Based on our analysis, Pittsburgh renters would see rents rise significantly if Amazon moved to the metro, but rents are starting at a relatively low level, with the city having the cheapest rents of the metros studied. Even if the metro builds quickly, which we assume they will, prices would rise due to increased competition for apartments by renters with significantly higher incomes. The median income in Pittsburgh is currently just $36,210 a year, just over one-third of the average salary of Amazon workers, and the increased demand for workers will likely also increase wages for non-Amazon workers. 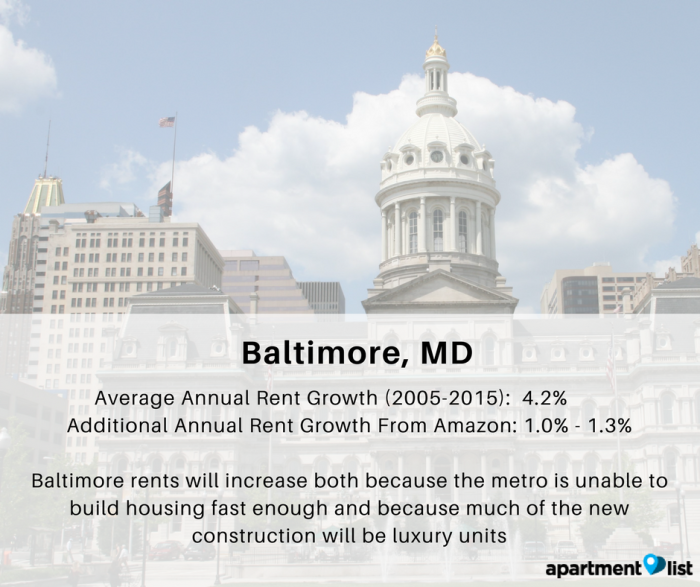 We predict rent increases in Baltimore if Amazon HQ2 is based there, due to the city’s inability to build enough housing and an expected increase in high-wage workers. Baltimore is the seventh hardest metro in which to build, leaving the metro unable to build fast enough to keep pace with the 11,625 additional new jobs projected each year as a result of Amazon. Additionally, Amazon workers earning six-figure salaries can afford more expensive apartments than the current median price, indicating much of the new construction will be at the luxury end of the market to appeal to these workers. Rents in Denver, Austin, Minneapolis, Philadelphia, Detroit, Boston and Atlanta will be moderately impacted by an Amazon HQ2, with rents increasing an additional 0.5 percent to 1 percent each year. The metros that are moderately affected tend to be a bit larger or are existing tech hubs, such as Denver or Austin, that will see significant job and rent growth with or without Amazon. As larger metros with high vacancy rates, Philadelphia and Detroit have a significant amount of slack in their housing market, helping protect these cities from more significant rent increases. 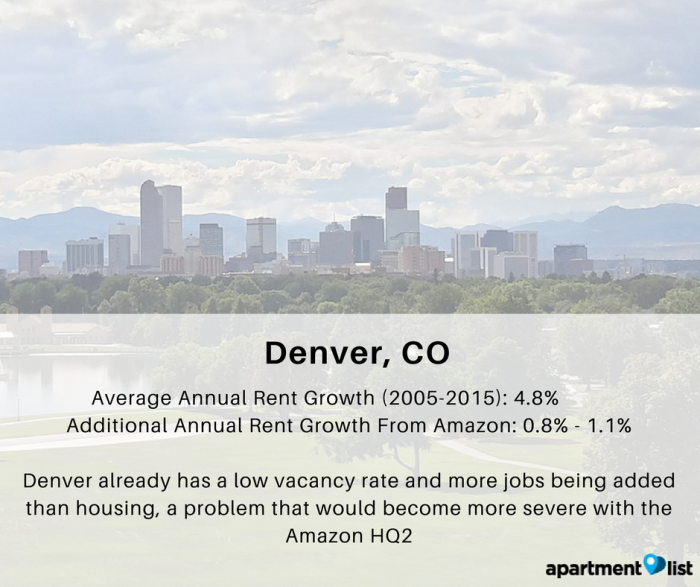 Denver, one of the most likely picks for Amazon’s HQ2, already faces an affordability crisis, with rents rising 52 percent between 2005 and 2015. With a low vacancy rate and too little permitting, Amazon’s new HQ2 presence would increase rents an additional 8.8 percent over 10 years. Lower wage workers, including those needed to support Amazon, would be especially impacted by these rent increases, as new housing built for Amazon and other tech workers would skew towards the luxury end of the market. 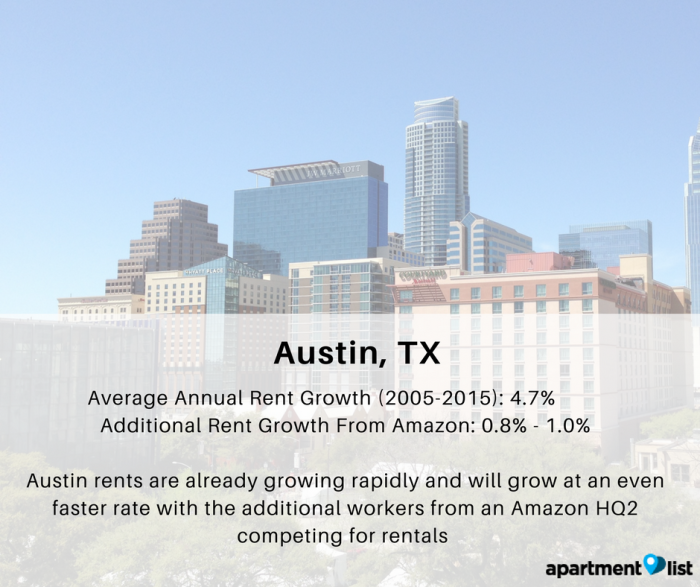 Like Denver, Austin rents are growing rapidly, and the additional Amazon workers would push rents even higher. Austin is smaller than Denver, amplifying the impact of the additional Amazon HQ2 workers. Luckily, Austin has a bit more slack in its housing market, with a vacancy rate of 8 percent and a higher rate of permitting compared to job growth. With relatively low median wages, some of the rent growth in Austin is expected from an increase in high-paid workers who will rent more expensive apartments, pulling the median rent up. If the new Amazon HQ2 came to town, Detroit would see moderate rather than severe rent increases, largely because of its high vacancy rate of 11 percent and its ability to add new housing stock rapidly. 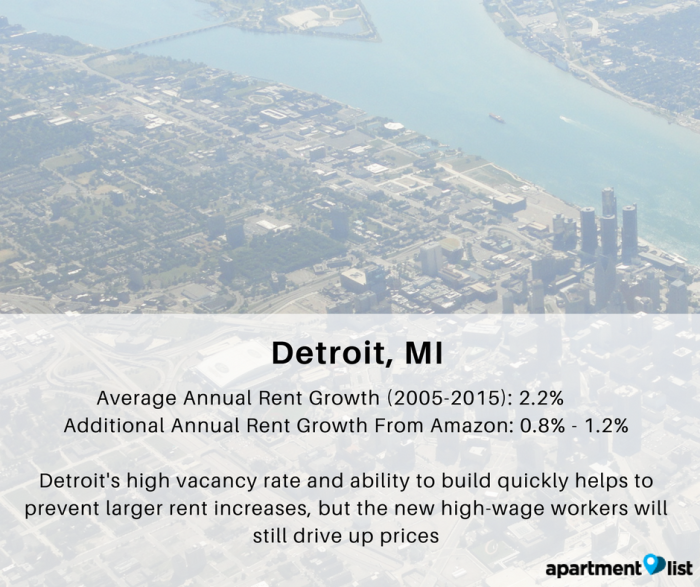 Most of the rent increase in Detroit would be caused by the influx of Amazon workers with much higher wages than the current area median and the ability of Amazon workers to pay more than the metro’s current median rent. 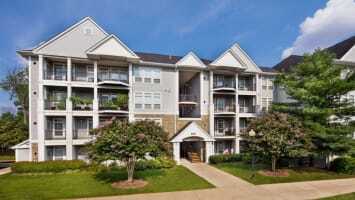 These workers would increase the demand for new luxury construction. As a moderately-sized metro experiencing relatively slow workforce growth, the Amazon HQ2 represents a large jump in job creation for Minneapolis. The metro would be able to speed up construction, but not enough to prevent some rent increases. Additionally, much of the new construction would be at the luxury end of the market, increasing overall median rents. 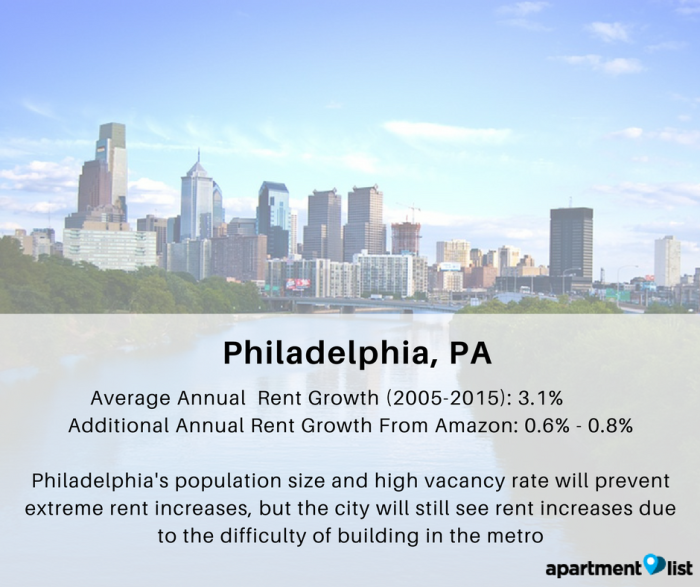 Philadelphia’s large size and high vacancy rate of 9 percent help mitigate some of the rent impacts of the Amazon HQ2. The difficulty of building in the metro will still put some upward pressure on rents with the additional workforce growth. The metro approved less than 11,000 new permits a year from 2005 to 2015, a rate that would need to increase to accommodate both the existing job growth and the new Amazon workers. 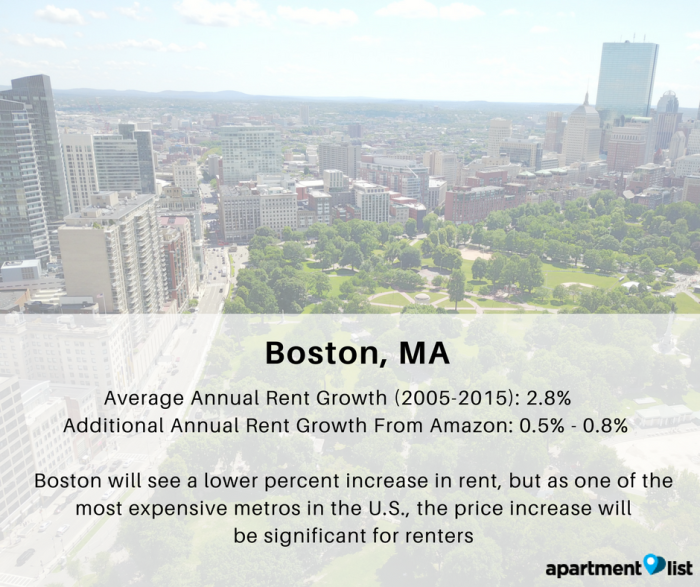 Boston’s relatively large population and housing stock help mitigate some of the impacts on rent prices, but as one of the most expensive rental markets in the country, any rent increase will be noticeable to renters. Even without an Amazon HQ2, Boston struggles to build enough housing to keep up with its growing workforce, a problem that will be more severe with over 10,000 additional jobs per year. As a metropolitan area of almost six million, Atlanta is better equipped to incorporate the inflow of new workers and build enough housing for its growing population. From 2005 to 2015, Atlanta averaged over 25,000 permits per year, building more than any other metro studied besides Dallas. 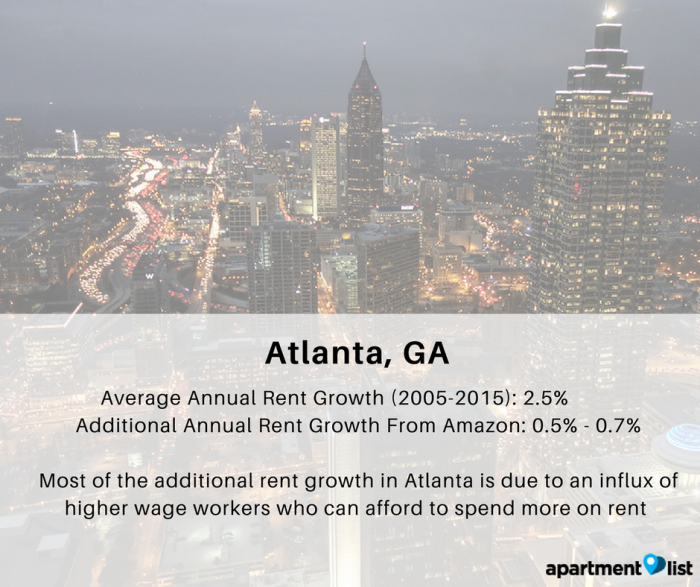 Most of the increase in rents in Atlanta would be due to an increase in the number of higher-end apartments rented by Amazon workers earning far more than the current area median of $36,340. The metros least impacted by the by Amazon HQ2 are large metros where the expected growth in workers represents a smaller percentage of the existing workforce. Washington, DC, Chicago, Dallas and Los Angeles, with metro populations of 6.1 million people to 13.3 million people, experience additional rent growth of under 0.5 percent a year. With the existing vacant units and relative ease of building, Chicago is better prepared to handle the job growth from the Amazon HQ2 than most metros. Although Chicago does not have the highest vacancy rates of the metros studied, it does have the most overall vacant units due to its large housing stock and 8.6 percent vacancy rate. Washington, D.C., has already been experiencing rapid job growth and new construction, and the region would likely speed up construction to accommodate the new workers. Although metro-wide the rent impacts would be relatively small, rents in specific neighborhoods that are popular with tech-workers would likely see much larger rent increases. Los Angeles is already experiencing a housing shortage, with rent and home prices on the rise and millennials struggling to save for down payments on homes. From 2005 to 2015, Los Angeles added around the same number of units as Washington, D.C., despite having twice the population. With low vacancy rates and slow construction, the additional workers needed will drive up rents. Luckily for renters, Amazon’s 120,000 workers are just a small share of the metro’s workforce of nearly six million, mitigating some of the impact. With lax-building restrictions and a cheaper labor pool, Dallas is the best prepared to house the new Amazon workers. On average, Dallas added 55,532 jobs and approved 37,382 new building permits a year between 2005 and 2015. Thus, the additional Amazon jobs are small relative to the metro’s overall job growth. 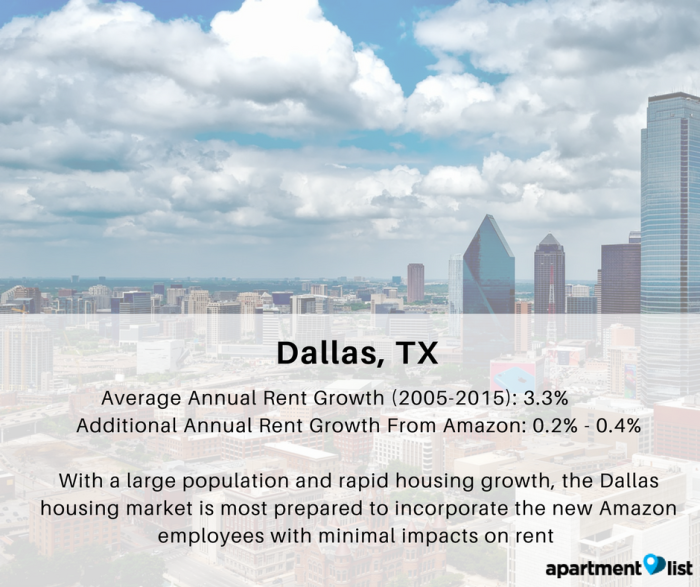 Most of the projected rent growth in Dallas would be driven by upscale units that we expect will be built for Amazon workers, amid relatively low current median wages in the metro area. In our new Apartment List analysis, we concluded that Amazon will increase rents in any metro it chooses for its HQ2, but certain metros are more sensitive to its impacts than others, with rents expected to rise an additional 0.3 percent to 2 percent a year in cities across the country. Metros with larger populations, more vacant units, the ability to ramp up construction and higher median incomes will see less of an impact. Renters in cities that are already experiencing rapid rent increases, such as Denver and Austin, should expect even faster rent growth. For some metros, such as Pittsburgh or Detroit, the rent growth may be a smaller price to pay for a boom in employment. 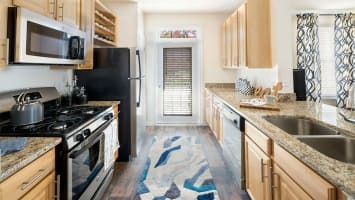 While homeowners may benefit from increased property values, renters and those hoping to purchase homes will feel the impact more severely. With rent growth outpacing wage growth, inclusive wage policies and more construction of affordable housing can help mitigate the impacts the new headquarters. 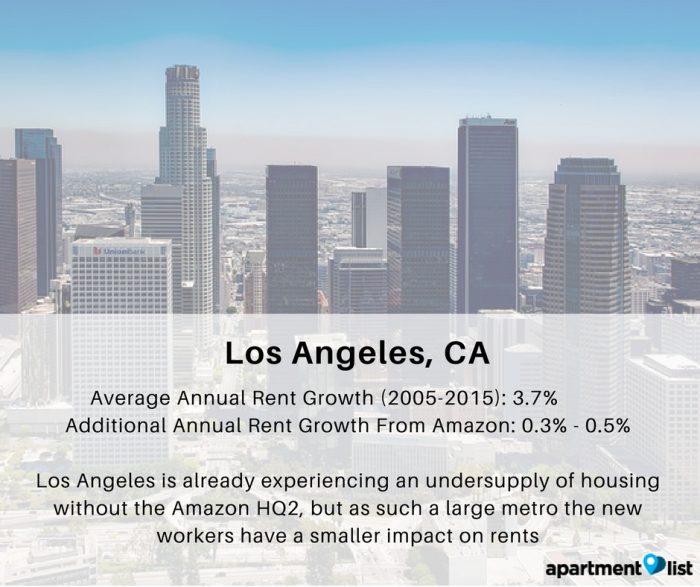 In order to predict the impact of the Amazon HQ2 on rent growth, Apartment List estimates the impact that a larger and higher-paid workforce will have in different metros. We account for the projected size and earnings of the expanded workforce, as well as the amount of new housing that each city is expected to produce, and we adjust our model’s input variables to develop high- and low-range estimates. To address the workforce expansion and metros’ housing supply response, we observe the ratio of net jobs added to new housing units permitted each year, on average, from 2005 to 2015 in each city. We then calculate what the ratio would be if Amazon added 50,000 Amazon workers and 62,500 supplementary workers over a ten year period, as Amazon’s RFP projects, and if the city’s housing supply grew 20 percent faster than it did in the earlier period.1 We adjusted the 20 percent figure up or down to reflect differences in metros’ level of difficulty in producing new housing, and we assumed that vacancy rates would drop to between 3 and 5 percent of the city’s housing stock. In a previous study, we associate changes in the ratio of new jobs to new housing with changes in rents, and we apply those results here to estimate how an increased workforce owing to Amazon’s HQ2 would change rents in each city. Our analysis assumes that if a worker from within the metro accepts a job with Amazon, their current job will be filled by another worker. To address the amount of rent the workforce including Amazon could afford and how it would differ from that of the current workforce, we calculate how the new workforce would affect the median income in each city. Using figures from the RFP, we assume the 50,000 new workers would earn $100,000 on average, and that supplementary workers would earn a fraction thereof, as per Amazon’s estimates. We then estimate the effect on rents implied by keeping the city-wide income-to-rent ratio fixed. 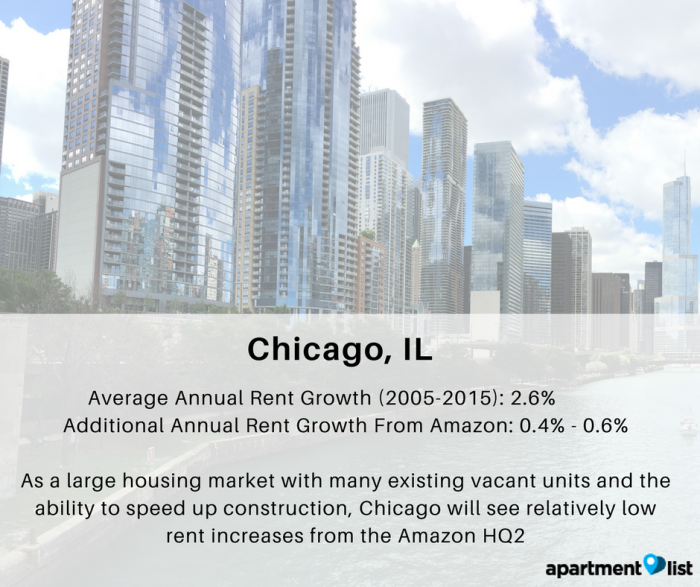 We take the overall impact of Amazon’s HQ2 on rents as the summed impact of the workforce expansion and the increase in median income.